The small cafe supports over 20 Michigan businesses, for ingredients and other business needs, in addition to 15 local farms. 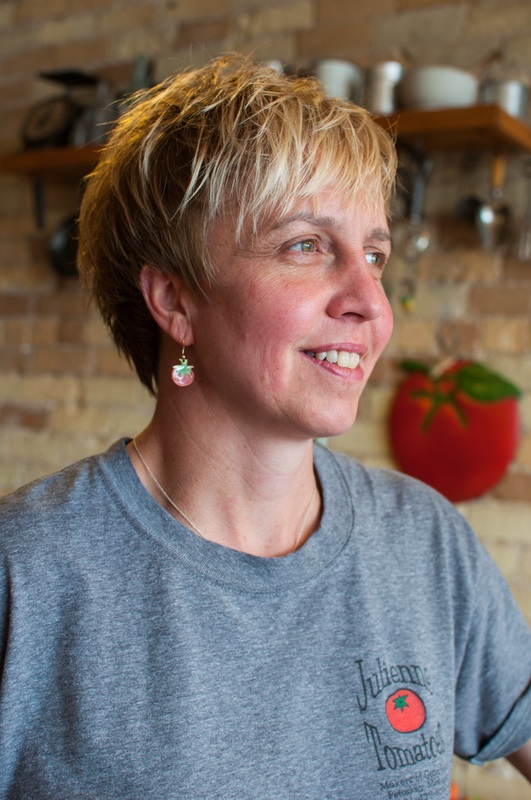 Julie loves helping people to make a connection with their food, and hopes enjoying locally sourced food in her cafe will encourage more folks to buy local food to cook in their home kitchens. Julienne Tomatoes is open Monday-Saturday for both breakfast and lunch. Weekday breakfasts feature simpler items like breakfast sandwiches, quiche, and homemade oatmeal while Saturday breakfasts offer more decadent dishes like french toast and pancakes. While I visited, Julie cooked me their incredible french toast, made with fresh local eggs from Cook Family Farm in Gaylord and cherry pecan bread from Crooked Tree Breadworks. 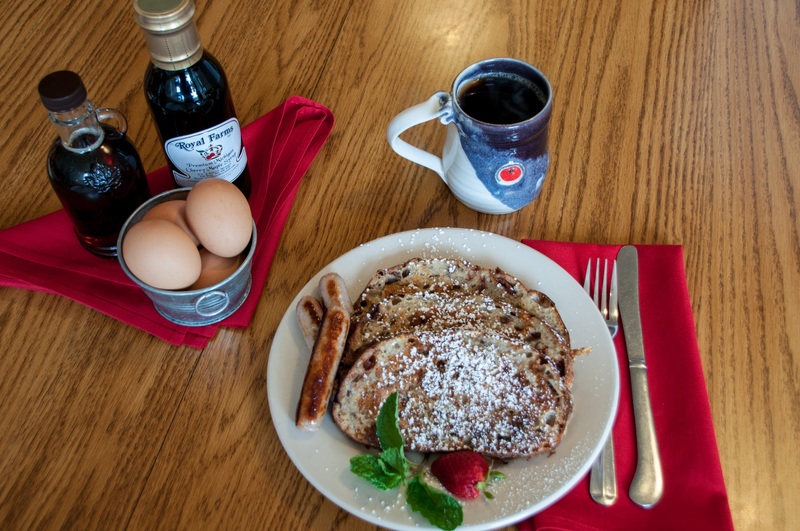 The french toast is served with pork sausage links from Plath’s Meats in Rogers City, and pure maple syrup from Harwood Heritage in Charlevoix or cherry maple syrup from Royal Farms in Atwood. That’s a whole lotta local in one dish! Lunchtime at Julienne Tomatoes offers a wonderful selection of house-made soups, salads topped with house-made dressings, and a long list of sandwiches on Crooked Tree Breadworks bread. Monthly specials feature the local, seasonal ingredients that have Julie most excited. I’ve always been a big fan of the “Gotta Try This” with roasted turkey breast, avocado, sprouts, and sun dried tomato mayo on parmesan pepper bread. And of course, don’t forget dessert! The case full of pastries is plenty beautiful enough to tempt anyone into a little something sweet to finish off their meal. 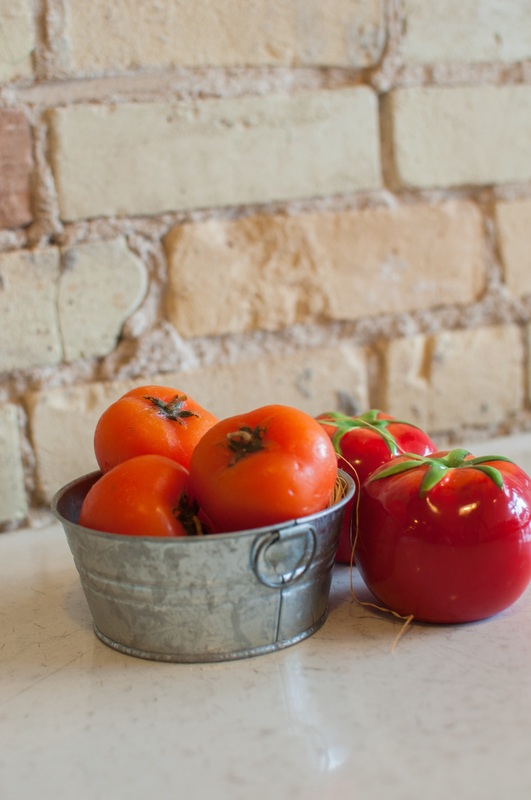 You’ll find Julienne Tomatoes tucked on a quieter block of downtown Petoskey, in what many Petoskey natives remember as the Grain Train’s old home. A building full of historic charm, with a timeline of previous occupants displayed prominently. It’s easy to imagine the space filled with any number of businesses, but the homey cafe feels like the perfect fit. If you’ve never been to Julienne Tomatoes, you’re missing out on one of the coziest community atmospheres in northern Michigan. It’s the sort of place where locals lose track of time catching up with old friends, and servers remember your name. That great atmosphere isn’t a coincidence. Julie puts great value in community and in cultivating a positive environment with her staff. There are plenty of young staff members – many of whom are working their first job at Julienne Tomatoes, after growing up eating in the cafe with their families. The positive environment built in the kitchen is apparent throughout the establishment, as the good vibes of a happy staff are passed on to the customers. And if we’re being honest, it’s just hard not to smile in this cozy space surrounded by tomatoey trinkets.